Carbon Steel Plate Flanges, CS Slip on Flange Manufacturer in India. Carbon Steel Blind Flanges Supplier, CS Pipe Flange Exporter. Carbon steel flanges are available in various standards such as DIN Flanges, ASME Flanges, EN Flanges, ANSI Flanges, BS Flanges, etc. Carbon steel pipe flange can be a solid disk or a ring or a collar that can be attached to different kinds of pipe applications and these restrict or allow the flow of gases and liquids. The higher the content of carbon in flange made from carbon steel, the harder and stronger is the flange. Carbon steel threaded flanges can be obtained in sizes of 1/2″ (15 NB) - 48″ (1200NB) and in classes/pressures of 900#, PN10, PN25, 600#, PN64, 150#, PN6, 2500#, PN40, 1500#, PN16, 300#, etc. These flanges of carbon steel are available in specifications of ASTM A105 / ASME SA105, A105N and in flange face types such as Ring Type Joint (RTJ), Raised Face (RF) and Flat Face (FF). Regal Sales Corporation is EIL approved supplier of Carbon steel plate flanges which are used in the sealing of valves, pipeline ends and various other connections. These flange have a high tensile strength and they are very durable. Carbon steel slip on flanges consist of a hole and they have a matching outside diameter of pipe and through this a pipe can be passed. This type of flange can also be procured in a large size, so as to enable the connection of storage tank nozzles with big bore piping. Slip on flanges of carbon steel are perfect for use in applications that involve the use of low pressures and low temperatures. Carbon steel blind flanges are akin to a regular flange in that they are a solid disk that is used to create a stop or to block off a pipeline. These flanges are used in various industries such as public services, petrochemicals, water works and pipe engineering. 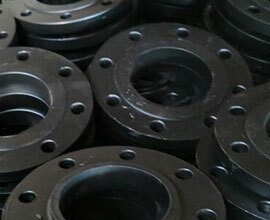 Carbon steel forged flanges are used in the creation of a pipework system, by connecting together pumps, valves, pipes and other types of equipment. Such types of flanges provide better strength and support and they are used in applications that involve the use of high pressure. With forged flange, internal defects are rarely seen. Carbon steel flange manufacturers today manufacture various types of flanges of carbon steel, but the most common types of these flanges are Slip On Flange, Threaded Flange, Ring/Spacer Flange, Paddle Blind Flange, Weld Neck Flange, Hub/Collar Flange, Blind Flange, Socket Weld Flange, Lap Joint Flange, Counter Bore Flange, Spectacle Blind Flange and Reducer Flange. As the name itself says, low temperature carbon steel flanges, it can easily be guessed that these are the type of flanges of carbon steel, that are designed primarily for use in low temperature applications. 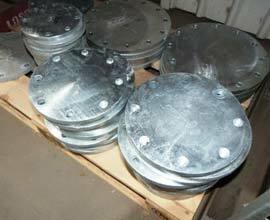 A particular grade of low temperature carbon steel flange is SA350 LF2. Flanges made from this material need notch toughness testing and they are used a lot in industrial applications such as in the oil and gas industry. Flange made of carbon steel are highly resistant to corrosion and they have a wide range of uses. Low Temperature Carbon Steel Flange Price List, Carbon Steel Forged Flanges Dimensions and Rating. Standard : ANSI Flange, ASME Flange, DIN Flange, EN Flange, BS Flange etc. ANSI/ASME B16.5, B16.47 Series A & B, B16.48, BS4504, BS 10, EN-1092, DIN, ANSI Flange, ASME Flange, BS Flange, DIN Flange, EN Flange, GOST Flange.